Swimmer’s itch is not life-threatening, and there are treatments and tips that can help prevent swimmer’s from getting it so they can more fully enjoy the refreshing waters. 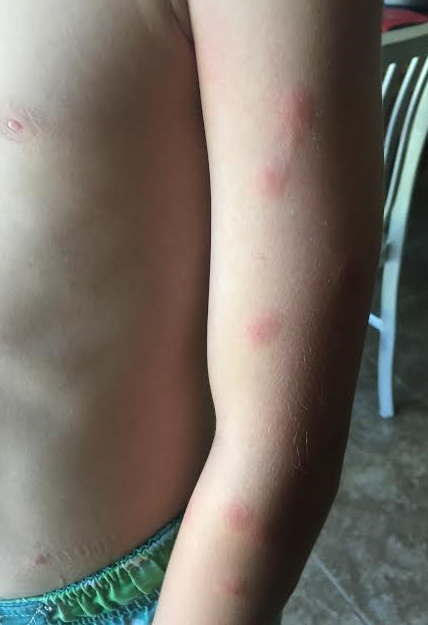 According to health.utah.gov, cercarial dermatitis — more commonly known as swimmer’s itch — is a skin rash caused by an allergic reaction to certain parasites found in some birds and mammals. These parasites are released from infected snails into fresh and salt water (such as lakes, ponds, and oceans). While the parasite’s preferred host is the specific bird or mammal, if the parasite comes into contact with a swimmer, it burrows into the skin causing an allergic reaction and rash. Although humans are not suitable hosts, the microscopic larvae burrow into the swimmer’s skin, and may cause an allergic reaction and rash. Because these larvae cannot develop inside a human, they soon die. Swimmer’s itch can be found throughout the world and is typically more common in summer months when water is warmer. It is highly unlikely that a swimmer can get swimmer’s itch from a swimming pool as long as the pool is clean and well maintained. Tingling, burning or itching can occur anytime from minutes after swimming in the contaminated water up to days later. Pimples will generally appear within 12 hours and can develop into small blisters. Scratching the pimples or blisters can lead to secondary infection. The CDC warms that because swimmer’s itch is caused by an allergic reaction to infection, the more often a person swims or wades in contaminated water, the more likely they are to develop immediate and serious symptoms. That being said, swimmer’s itch is not considered life-threatening and cannot be spread from person to person. 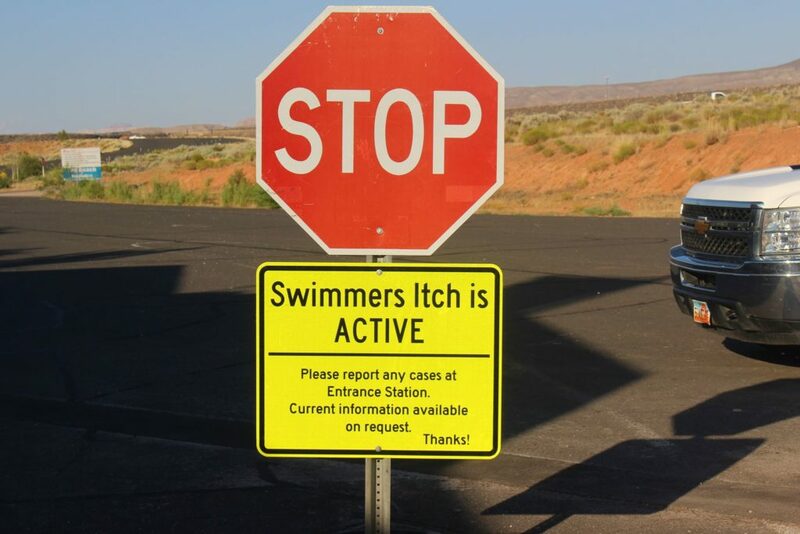 Swimmer’s itch is active at Sand Hollow Reservoir in Sand Hollow State Park. 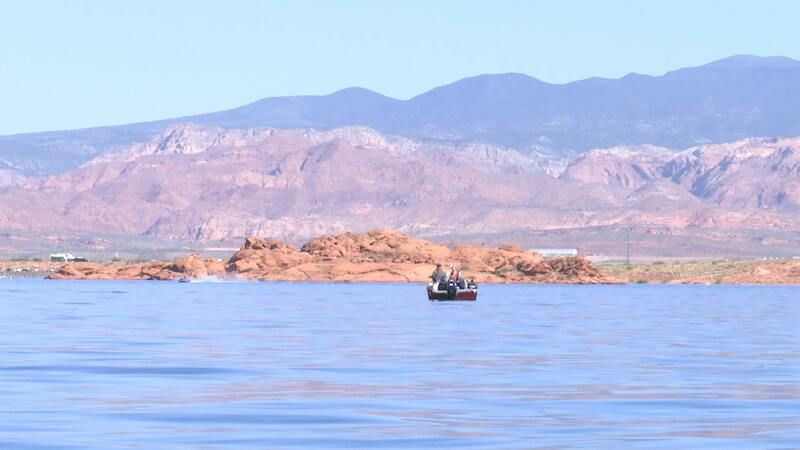 There have also been reports of swimmer’s itch at the new Fire Lake Park at Ivins Reservoir in Ivins. 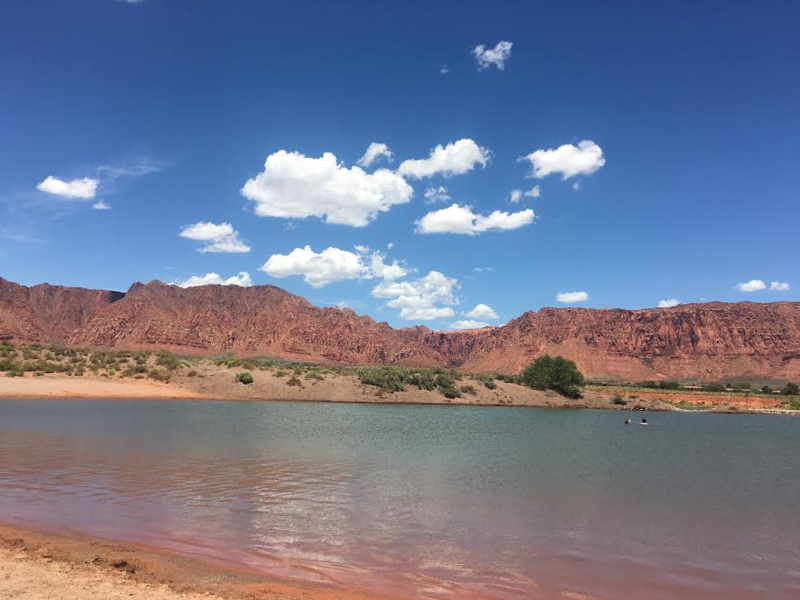 Sand Hollow has had about 33 reports of swimmer’s itch this season, Department of Natural Resources Park Manager Laura Melling said. The 33 reports represented more than 33 people, Melling said. While some reports only involved one or two people, she said, some reports reflected groups of as many as six people who were infected. Melling said she generally receives reports of swimmer’s itch when temperatures in the water reach 70 degrees or higher. However, the first reports this year came in when she was measuring water temperatures of 68-69 degrees. Melling takes water temperature at the boat docks where water is deeper and said that temperatures in the shallows could have already reached 70 degrees or higher. She added that the pattern for swimmer’s itch at Sand Hollow has been largely the same as previous years. While swimmer’s itch mostly lurks in the shallow, warmer waters, Melling cautioned that high boat and watercraft traffic acts as a giant egg beater stirring up the lake. In these situations, swimmer’s itch can be contracted anywhere on the water. Melling remains vigilant in helping people stay well-educated on swimmer’s itch. To that end, a large yellow warning sign has been placed at the entrance gate to the state park letting visitors know that swimmer’s itch is active. Visitors with more questions are given information pamphlets about swimmer’s itch and tips to prevent and treat it, Melling said. Sand Hollow State Park staff and officials urge people who have been infected with swimmer’s itch at the reservoir to report it. Melling said they ask questions about where swimmer’s were and what activities they were doing so that they can better inform future visitors. Ivins City Parks and Recreation director Benny Sorensen said that they have received about 10-20 cases of swimmer’s itch reported at the new Fire Lake Park swimming area at Ivins Reservoir. Ivins Reservoir has long been a favorite area for bird-watchers, a previous report on the Fire Lake Park said, who come to enjoy the sights of both migratory and local birds that frequent the area. But because birds act as a host for the parasite that causes swimmer’s itch and Ivins Reservoir is a bird landing ground, Sorensen said, it is difficult to keep it out of the swimming area. Neither Quail nor Gunlock reservoirs receive high reports of swimmer’s itch. Quail’s water is slightly more acidic than Sand Hollow’s, a factor which curtails swimmer’s itch, Melling said. Melling further said that if a body of water has cattails growing in the area, there is a good chance there will be swimmer’s itch parasites in the water. 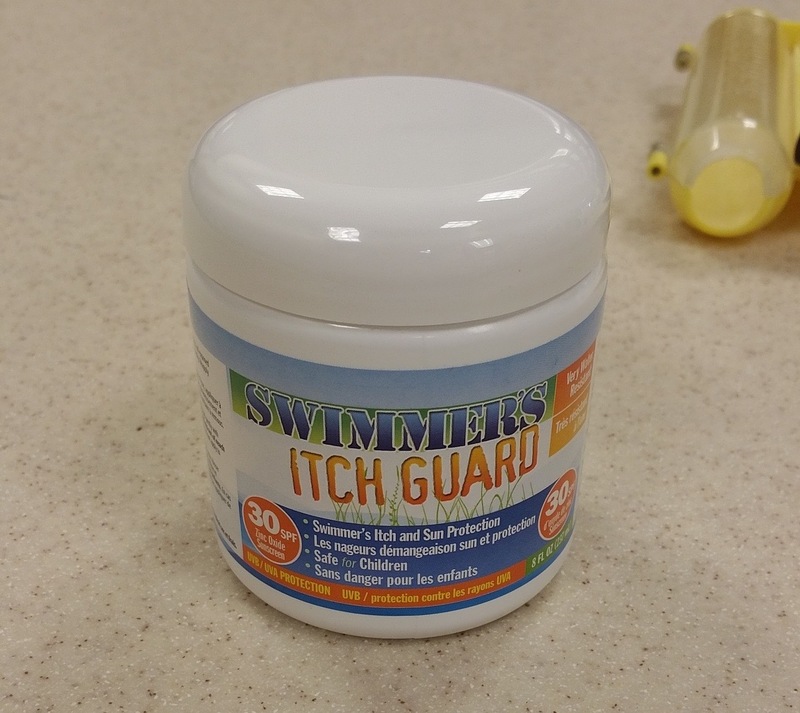 Stapley Pharmacy in St. George carries a cream called Swimmer’s Itch Guard that can be used as a preventive measure. Kenzie Truman, a clerk at Stapley Pharmacy, said it is a really popular item. The pharmacy usually orders a big case of the jars at the start of the summer season, she said, and by the end of summer, most of the jars have been sold. The eight-ounce jar also acts as a sunblock with SPF 30 and sells for $17.99. Stapley Pharmacy has locations at 102 E. City Center St. and 446 S. Mall Drive. Though it may be difficult, the CDC warns not to scratch the affected area. Scratching may lead to a secondary infection. If infection does occur or symptoms are severe, seek out a physician. that’s what happened to Dumpster. He drank too much parasite-infested water, and they got in his brain.